Tallinn, the capital and largest city of Estonia was quite enjoyable. It may have been our favorite city on the tour thus far. Perhaps it was a pleasant surprise because we hardly knew anything about Estonia or this medieval city whose old town is a UNESCO World Heritage Site. Established on the map in 1154, the city was conquered by Valdemar II of Denmark in 1219 and sold to the Hanseatic League in 1285. Tallinn passed into Swedish hands in 1561 and then to Russia under Peter the Great in 1710. In 1918, Tallinn excerpted its own independence before being occupied by the Soviet Union which was then conquered by Nazi Germany (1941-44) only to be retaken by the Soviets. Estonia again declared its independence in 1991. Tallinn is now home to 430,000 people, about one third of Estonia’s population. Estonia has its own language and there is not a word to distinguish between he and she. Everyone is an “it”. Fortunately, our tour guide spoke fantastic English. She said TV helps a lot. Our walking tour included the most popular sites in Estonia. 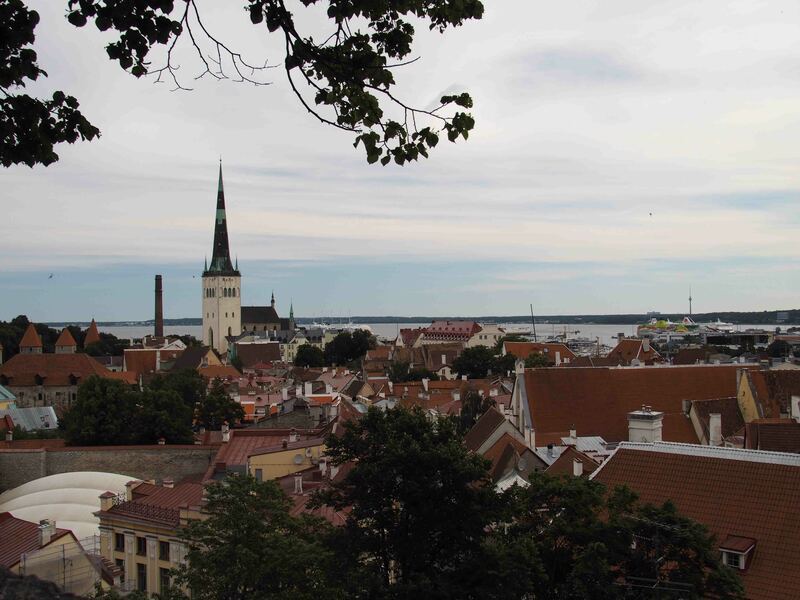 We began by walking up Toompea Hill to Hermann’s Tower flying the Estonian flag. Whatever flag is atop this tower signifies the ruling country. Estonia’s flag is three stripes of blue, black, and white. Blue represents the sky. Black represents the soil. White represents hope and prosperity. Near the tower was the Alexander Nevsky Cathedral, a Russian Orthodox Church. It’s five domes were topped with symbols of a diagonal line and crescent moon. The diagonal line represents the path between heaven and hell, and the crescent moon represents salvation. We were able to enter the church during a service. No benches are in the church, so the congregation must stand or kneel for the 90 minutes. A different Saint could be worshipped in each of the church’s alcoves and the decorative columns were painted like a barber’s pole. We continued along the hill to Cathedral of Saint Mary the Virgin. In history, this was the church of the nobles and 108 coat of arms are displayed in the church. We were asked not to enter during its service so we weren’t able to see the insides though had we been able to enter, we probably couldn’t have snapped a photo. The churches need money and sell post cards to help their budget. After taking in a few views from the city, we walked down to the city wall and towers. The whole wall is not in tact, but it offers lovely entrances into the old town. The houses were built with no space in between, so many of the cobblestone streets were somewhat long. Houses were erected first and then the streets laid, so they turned a variety of ways. We passed by St. Nicholas’ Orthodox Church which melted the locks on the doors during the raids in the early 1500’s, so it still has art from before the reformation. It is now a museum. We found a wheel well in the intersection of one street where cats used to be sacrificed. Soon we ended up near the town’s oldest cafe and another church with a cool wood clock that still worked. Our tour included a food tasting and folklore show. We tried pickled pumpkin, cheese, and some sort of berry drink. We then watched some local men play a variety of musical instruments from large horns, to bagpipes, to tiny pieces of bark. It soon became a participatory event like an episode of the Amazing Race. We danced and sang before we were eventually set on our own. Our guide provided a variety of tips from where to go in Tallinn, what to buy, and what would be expensive. Surprisingly, Tallinn was far more expensive than Gdansk or Klaipeda. The locals are very good knitters and carvers. We found a variety of wool and wood items that were very nice. We also walked through St. Catherine’s passage where local artists displayed their works. A quaint nook, home to a cafe and chocolatier, called our name for lunch. We sat on a lovely outdoor patio covered by a trellis of vines while local musicians played their instruments. Our lasagna bakes were rich and tasty. Of course, we had to finish lunch off with a truffle. With our stomachs full, we did some more walking. We found a fantastic green space outside the city wall showcasing a flower festival for the summer. Each area on display, had a theme. One was the Olympics. Vines from different countries competed for the fastest growing plant. Other areas represented the ocean, a natural setting, and even food. Vegetable plants grew on the word SOOK which meant food. The festival was quite nice. We wandered through Raekoja Plats too. It is old town’s plaza which was home to a market, a stage of musicians, and the town’s oldest drug store. Really, at every turn we found something interesting along with a tourist store. Tallinn was definitely highly dependent on tourism and as such almost everything was open! We even found a Texas honky tonk. Our travel book suggested we try the honey beer at Olde Hansa. The restaurant only served “medieval” food. Bear was on the menu. We got our beer in clay mugs before we called it the day and returned back to the ship around 4:30. There was much to see and do in Tallin. I loved the ornate doors. I probably could have stayed one more day and taken a guided tour of the Hotel Viru where dignitaries stayed and were recorded by the KGB. I wouldn’t have minded getting a better glimpse of freedom square, somewhat dilapidated, but a big open area for concerts. And who knows, maybe the concrete apartment blocks built during the Soviet reign could have interesting. Want to take this blog post with you to read offline later? WANT TO VACATION SOONER? THIS CLUB IS FOR YOU! For notecards and key chains, visit My Shop on this website or Etsy. For other products and digital prints, visit My RedBubble Products and my portfolio at 123RF.